.... I learned early on in this job that Prof. Krugman would likely be more willing to contribute to the Frist for President campaign than to acknowledge the possibility of error. When he says he agreed “reluctantly” to one correction, he gives new meaning to the word “reluctantly”; I can’t come up with an adverb sufficient to encompass his general attitude toward substantive criticism. ....he does himself and his cause no good when he heeds the roaring approval of his acolytes and dismisses his critics as ideologically motivated.) But I don’t want to engage in an extended debate any more than Prof. Krugman says he does. If he replies to this statement, as I imagine he will, I’ll let him have what he always insists on keeping for himself: the last word. Mr. Bush, who put up 1.8 percent of the Rangers syndicate's original capital, was entitled to about $2.3 million from that sale. But his partners voluntarily gave up some of their share, and Mr. Bush received 12 percent of the proceeds — $14.9 million. So a group of businessmen, presumably with some interest in government decisions, gave a sitting governor a $12 million gift. Shouldn't that have raised a few eyebrows? In the last sentence above, there are three fallacious statements! 1. General Partnerships are common in purchasing professional sports franchises. It most certainly did exist (they wouldn't have been granted the right to purchase the Rangers by Major League Baseball if it didn't). Bush got more than his 'share' by the simple matter of being the Managing General Partner. I.e., The guy whose liability was not limited to his investment, unlike the other limited partners. 2. We weren't 'only hearing of it now ', it had been written about in the Texas newspapers, as well as in the Washington Post in 2000. 3. It was public knowledge, and the voters of Arlington, Texas, with that knowledge, decided to build a new stadium for the team (which is regrettable, but the way the game is played). Krugman then went on to claim this perfectly commonplace business transaction (common not only for pro sports, but in the oil and gas business) to be evidence of 'crony capitalism'. For just the reason Okrent recognized. Krugman can't, acknowledge the possibility of error. Creating aurora activity, says NASA: A coronal mass ejection hit Earth's magnetic field on May 15th, sparking an extreme geomagnetic storm. The thieves typically come at night, sometimes illuminating their work with headlamps or muffling the sound of chain saw exhaust by attaching a hose that runs into a bucket of water. When they are done, the scene is similar to one Greg Peterson found recently on his 31 acres near Port Gamble Bay -- discarded branches sticking up from the ground and two missing maple trees. ....The targets often are big-leaf maples between 60 and 100 years old, which offer a chance at valuable wood prized by craftsmen. Such timber -- known as "figured" wood -- displays a special three-dimensional grain that is coveted by guitar and fiddle makers around the globe. Officials say craftsmen may pay hundreds of dollars for a couple of maple boards that end up as particularly beautiful instruments. ....Another recent incident involved thieves cutting down several maples along state Route 104, removing chunks a few feet long in their search for the special grain. In other cases, contract loggers have removed more trees than their clients authorized, sometimes returning after the legitimate job was completed. In eastern Jefferson County, maple poachers cut a half-mile of vehicle trails through a fragile state wetland and stole up to 50 maple trees, Cronin said. The domestic demand for electric guitars grew 43.5 percent last year, while the acoustic guitar market climbed 38.6 percent, according to the International Music Products Association. Eric Clapton was unavailable for comment. In Daniel Okrent's parting shot as public editor of The New York Times, he levied a harsh charge against me: he said that I have "a disturbing habit of shaping, slicing and selectively citing numbers in a fashion that pleases his acolytes but leaves him open to substantive assaults." I want to go back to doing what I have been doing all along: using economic data to inform my readers. Thanks for sharing that. Now, just what were those specific examples? The hangover theory, then, turns out to be intellectually incoherent; nobody has managed to explain why bad investments in the past require the unemployment of good workers in the present. Yet the theory has powerful emotional appeal. Usually that appeal is strongest for conservatives, who can't stand the thought that positive action by governments (let alone—horrors!—printing money) can ever be a good idea. .... And some people probably are attracted to Austrianism because they imagine that it devalues the intellectual pretensions of economics professors. But moderates and liberals are not immune to the theory's seductive charms—especially when it gives them a chance to lecture others on their failings. ...the president came in inheriting an economy that was sliding into recession. He cut taxes in part to stimulate the economy, and I think that did have a positive impact on the growth of the past few years. He also, in the aftermath of 9/11, had to increase spending on defense and homeland security. But over time everyone agrees we have to reduce the budget deficit and move toward budget balance. Nope. In Washington-speak, there's a *big* difference between "balance the budget" and "move toward budget balance." There's also a big difference between "the administration's plan is to..." and "everyone agrees we have to..."--especially when it's not true: in the White House, at least, there are a lot of people who agree that they have to *say* that they want to reduce the budget deficit, but few who believe they should *do* anything to reduce the budget deficit. "... over the long term, the key fiscal challenge is not the short-run deficit, it’s the long-run budgetary pressures coming from entitlements, which is why Social Security reform is such an important priority." All he forgot was to add Medicare/Medicaid reform. ... by day only because rough men stand ready to do violence on their behalf. Unbelievable, me and one other person post on Brad DeLong's site simply pointing out out, in a completely polite manner, that it is unprofessional to delete and alter people's posts merely because they disagree with you, and what happens, he deletes those posts, along with several posts refuting his and Krugman's argument, and bans me from the site! It is downright Orwellian. All dissidence will be eliminated, it never existed. I feel sorry for anyone in DeLong's class who takes a view in opposition to the teacher, he had better pack up and transfer to Stanford or something. Well here at The Chief Brief, we don't just mouth the words of democracy, dissent, openmindness and freedom, we practice it. I have not, and will not delete anyone's post for any reason other than profanity or obscenity. I welcome dissent and criticism. Tell me I am wrong, tell me HOW I am wrong, make me work for every argument I make. Make well thought out counter arguments and post facts that prove I am an idiot. You learn nothing from people just telling you how great you are all day. It is his website, he can do anything he wants, but how insecure do you have to be to allow posts only from people who agree with you? Chief, we salute you this Memorial Day. Shakespeare won't be on the playbill when Kent Phillips finishes plans for his theater group's next season. Instead of a 15-player production of the Bard's "Richard II," he is looking into a two-man show by Noel Coward. Phillips, interim director of the Tacoma Actors Guild and managing director of Bellevue Civic Theater, didn't pull his Shakespeare plans for artistic purposes. He was reacting to news that the state has been auditing other theater companies and fining them for paying actors honorariums and stipends rather than treating them as full-fledged employees. ...."I'd rather be safe than sorry," Phillips said. And dropping from a 15-person to a two-actor show in Tacoma, with a similar reduction in Bellevue, would cover his company's extra costs for the season if the entire industry must change how it pays for its art. At least three theater companies in the region say they are facing fines from the state Employment Security Department. And dozens of others -- along with the broader arts community -- are worrying about what the change could mean. "This is one that could have a real detrimental effect, not just in Seattle but across the state. And it might not just be theater companies, it might be all kinds of venues," said Gretchen Johnston, executive director of the Washington State Arts Alliance, a non-profit advocacy group that will start examining the issue at a meeting today. "The implications are far beyond the theater community. It will cost everyone more," said Karen Zeller Lane, executive director of Theater Puget Sound, who said other theaters have faced audits as well. "You look at musicians. Dancers. Festivals. ... What about the church soloist?" she said. Similar issues at symphony orchestras in Oregon over the past few years have caused music festivals to be canceled or cut back, according to the Statesman Journal in Salem. At issue is the practice among small and midsize theaters to treat some actors, technicians and designers as independent contractors rather than as employees. Theater directors say paying a fixed payment or weekly stipend is a way to honor and at least slightly subsidize their creative work -- and provide a stepping stone to higher-paid Equity jobs -- without completely breaking the bank for community non-profits. Now, they say, the state is telling them that workers should be classified as employees, meaning they should pay an hourly salary of at least minimum wage, plus contribute to the state's unemployment and workers' compensation funds. Welcome to the Employer Clubhouse, friends. An Oregon woman has filed a $3 million lawsuit against Yahoo!, alleging the Internet site failed to follow through on a promise to remove naked pictures of her from the Web. Cecilia Barnes, 48, in her lawsuit filed Tuesday in Multnomah County, claims an ex-boyfriend started posting "unauthorized profiles" of her in December that included revealing photos. The profiles also included her e-mail address and work phone number. Moreover, the former boyfriend engaged in online discussions in Yahoo! chat rooms, posing as Barnes and directing men to the profiles, the suit claims. "Due to these profiles and online chats, unknown men would arrive without warning at plaintiff's work expecting to engage in sexual relations with her," the suit says. In July 2001, Paul McCulley, an economist at Pimco, the giant bond fund, predicted that the Federal Reserve would simply replace one bubble with another. "There is room," he wrote, "for the Fed to create a bubble in housing prices, if necessary, to sustain American hedonism. And I think the Fed has the will to do so, even though political correctness would demand that Mr. Greenspan deny any such thing." ....That's why it's so ominous to see signs that America's housing market, like the stock market at the end of the last decade, is approaching the final, feverish stages of a speculative bubble. ....In parts of the country there's a speculative fever among people who shouldn't be speculators that seems all too familiar from past bubbles - the shoeshine boys with stock tips in the 1920's, the beer-and-pizza joints showing CNBC, not ESPN, on their TV sets in the 1990's. ....So what happens if the housing bubble bursts? It will be the same thing all over again, unless the Fed can find something to take its place. And it's hard to imagine what that might be. ....the Fed does seem to be running out of bubbles. The filibuster is far from dead in the Senate. Putting a fitting exclamation point on weeks of bitter partisan fighting, Democrats initiated a stunningly successful procedural attack on Thursday against one of President Bush's high-profile nominees, just days after an unusual compromise averted a showdown over the right to filibuster judicial candidates. The vote against cutting off debate over the confirmation of John R. Bolton to be ambassador to the United Nations, just as Congress was recessing for Memorial Day, left Republicans fuming and showed there is still some distance to travel to reach the new spirit of Senate comity that some believed was represented in the judicial pact announced Monday. "It lasted about a day and a half," said Senator Mitch McConnell of Kentucky, the No. 2 Republican. ...."In this atmosphere of trust, you have to take people's word," said Senator John McCain, Republican of Arizona, as he left the Senate chamber. ....Dr. Frist said "actions speak volumes" in his statement after the Bolton defeat, referring to Senator Reid's speech. "Tonight, after the Democrats have launched into yet another filibuster of a presidential nomination," he said, "those words seem empty and hollow." ...."This is what is disappointing," said Senator Lindsey Graham, Republican of South Carolina and another one of the Gang of 14. "The spirit of the deal was that we can do better if we all try." OSLO, Norway -- An enterprising Norwegian found a way to turn a tidy profit on Oslo real estate by renting out a nice apartment in a popular part of town. What the renters didn't know was that the 29-year-old man, whose name has not been released, had broken in to someone else's apartment and rented it out to 11 different people, national news media reported Tuesday. ....Eleven people were so eager to rent the space they each paid a $2,340 deposit. A total $25,780 was transferred to the swindler's bank account. Ingrid Christensen, of the Oslo police, told Norway's largest newspaper, Verdens Gang, that the money was found in the suspect's bank account and he would face fraud charges. The real renter was traveling at the time of the showings and has now changed all the locks. Different parts of the brain must work together to understand sarcasm, new research suggests. The prefrontal cortex - a small area in the front of the brain - seems to play the biggest role and may integrate the literal meaning of a phrase with the speaker’s emotional intent. The findings on the anatomy of sarcasm could have implications for understanding personality changes in people with brain injury or disease. “Decision making, emotional processing, empathy, and theory of mind all appear to be involved in understanding sarcasm,” says lead researcher Simone Shamay-Tsoory, a neuropsychologist at the Rambam Medical Center in Haifa, Israel. ....To determine if participants understood sarcasm, researchers read a sarcastic and non-sarcastic version of a story and asked participants what the speaker meant in each situation. They also tested ‘theory of mind’ - the ability to understand another person’s frame of mind - by determining if people could recognise when a story contained a “social faux-pas”. Shamay-Tsoory and colleagues found that people with prefrontal damage had trouble recognising sarcasm, while people with damage in posterior brain areas were unaffected. People with damage in the right hemisphere and the prefrontal lobe also had problems understanding the emotional cues involved in processing sarcasm, such as tone of voice or theory of mind, which correlated with their ability to understand sarcasm. 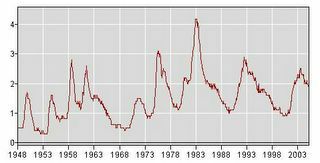 "...workers lose their jobs more often... "
The above graph (courtesy of the BLS) is of people who have lost their jobs and are looking for work from 1967 (apparently the first year for which they have the data) to the present. And it is again clear that prior to the Reagan Revolution that trend was worsening--whether you look at peaks or troughs--but, since then the trend is one of improvement. That is, Krugman is once more refuted. We hope Robert Waldman is happy. Over the past 25 years the lives of working Americans have become ever less secure. ...workers lose their jobs more often, and unemployment lasts much longer than it used to. 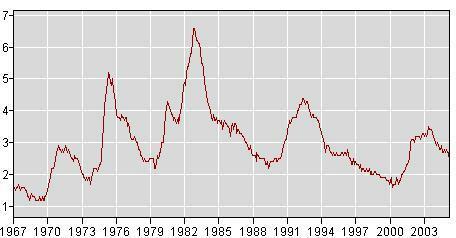 The graph is the percentage of the civilian workforce unemployed for 16 weeks or more, seasonally adjusted. From the Bureau of Labor Statistics. It clearly shows that in the 1950s the trend was steeply up. As it was after the end of the Vietnam war until the Reagan Revolution. It has not hit 3% of the workforce since the recovery from that severe early 80s recession--itself a by product of the stagflation of the 1970s. 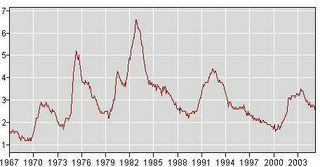 The peaks and trought post-1983 clearly are trending downward. We, of course, don't know what the trough will be for this cycle. King County's [the Democrat's strongest county, where Gregoire got 78% of the votes] mail ballot supervisor raised concerns about the county's inability to track ballots as early as spring of 2004, she testified Wednesday in the gubernatorial election challenge trial. Nicole Way testified she repeatedly told her supervisors that the county elections department couldn't tell how many ballots were being mailed out or received back. ....Way said she repeatedly talked to her direct supervisor, Garth Fell, and his boss, Elections Superintendent Bill Huennekens, about the problems. ....She said that she and her supervisor, Garth Fell, agreed to simply add the number of ballots accepted and rejected to get the total number of ballots returned, because the county's tracking system was unable to accurately produce that number. [GOP Attorney Harry] Korrell asked whether Elections Superintendent Bill Huennekens - Fell's boss - knew the report was inaccurate before he presented it to the county canvassing board. "I thought he did," Way said. On Tuesday, Huennekens denied knowing in advance about inaccuracies in the Nov. 17 mail ballot report. "I don't remember specifically" talking to Way or Fell about the report, Huennekens testified. GOP attorney Rob Maguire asked if he knew how the numbers were calculated. "I can't say that I did, no," Huennekens said. "Does King County know the true number of absentee ballots returned for the 2004 November general election?" Maguire asked. "We physically have them," Huennekens replied. "I don't know that we have an exact number." It was only on the third count that Republican Dino Rossi's initial lead was turned into a 129 vote victory for Gregoire. Okay Brad, listen up. I'm just a working class guy teaching at a working class university. EconoPundit is blue collar, and he keeps things simple. He tries to stay away from charts his readers don't know how to duplicate or (adjust if they want). We've moved out of a world with more-frequent recessions but shorter job search times, into a world with fewer recessions and longer job search times. But is the working class (to which I belong, remember) ready to join Krugman's Committee for the Return to Depression Economics? Polling data say "no", and maybe there's a good reason. Well, just bless my forked-keyboard (or whatever one uses to "write" with a "forked tongue")! 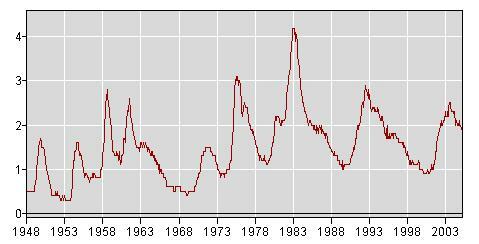 Doesn't it look like real quarterly unemployment benefits per unemployed person have trended upward over the past half century? So we live in a world of fewer recessions, longer job-search-time, and higher benefits per person. Maybe that's why everyone is so optimistic. As well as the Chief, James Bennett, who manages to confront the Edward Scissorhands of Berkeley Blogging without becoming a non-person. A 2-year-old Seattle ordinance that was meant to control peanut and T-shirt vendors working the area around Safeco and Qwest fields was instead used primarily to catch people selling Mariners and Seahawks tickets. More than 100 citations for ticket selling were issued by off-duty police officers hired by the two sports teams, using the city's mobile-vending ordinance. Only two citations clearly involved ticket scalping, or charging more than face value, according to data supplied by the city's transportation department, which administers the ordinance. ....The mobile-vending ordinance, last modified in September 2003, requires vendors to obtain street-use permits to sell on streets surrounding Safeco and Qwest fields. It also bans any selling near the ticket windows. ....An analysis of 146 citations issued under the mobile-vending ordinance shows that 109 — about three out of four issued since the law took effect in September 2003 — were for ticket selling. Now where's that cocktail waitress? 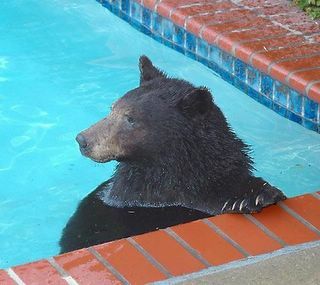 LOS ANGELES — A 140-pound bear wandered into a suburban neighborhood and took a dip in a swimming pool before being tranquilized and returned to the wild. The female bear ambled into the San Fernando Valley's Porter Ranch area shortly after 6 p.m. Sunday, bumping into doors and windows before taking a few splashes in a backyard pool, fire spokesman Brian Humphrey said. Homeowner Maryam Salahael pulled her children out of the pool when the bear showed up, and she called 911. ....During an interview yesterday with Globe editorial writers and columnists, the former Democratic presidential nominee was asked if had signed Form SF 180, authorizing the Department of Defense to grant access to all his military records. 'I have signed it," Kerry said. Then, he added that his staff was ''still going through it" and ''very, very shortly, you will have a chance to see it." The devil is usually in the details. With Kerry, it's also in the dodges and digressions. ....He did not answer the question of when he signed the form or when the entire record will be made public. ....The campaign waged against him by the Swift Boat Veterans for Truth arouses Kerry's greatest passion. ''What they said was untrue," he said. He considered, but decided against, filing suit against the group, which alleged that he did not deserve his Vietnam military honors. Kerry insists ''The truth in its entirety will come out . . . the truth will come out." Signing Form 180 is the first step. Releasing his entire military record to the public is the second. ...."Many of these nominees have waited for quite some time to have an up-or-down vote and now they are going to get one. That's progress," said press secretary Scott McClellan said. "We will continue working to push for up or down votes for all the nominees." Everyone loves historical analogies. Here's my thought: maybe 2004 was 1928. During the 1920's, the national government followed doctrinaire conservative policies, but reformist policies that presaged the New Deal were already bubbling up in the states, especially in New York. In 1928 Al Smith, the governor of New York, was defeated in an ugly presidential campaign in which Protestant preachers warned their flocks that a vote for the Catholic Smith was a vote for the devil. But four years later F.D.R. took office, and the New Deal began. Of course, the coming of the New Deal was hastened by a severe national depression. Strange to say, we may be working on that, too. Let the substantive assaults begin. London - Couples desperate to produce a son could boost their chances if one of them switches to a "masculine" profession such as engineering or accountancy, a report said on Sunday. Equally, those keen for daughters are more likely to have success if they hold down "caring" jobs such as teaching or nursing, a British study has discovered. The conclusion comes from a survey of 3 000 people from various professions by the London School of Economics and printed in the Journal of Theoretical Biology. In the population as a whole in Britain, roughly 105 boys are currently born for every 100 girls, according to the study, The Sunday Times newspaper said. But according to calculations by chief researcher Satoshi Kanazawa, for engineers and other "systemisers" the ratio is 140 boys per 100 girls.Nurses and the like produce around 135 girls for every 100 boys, the study found. Kanazawa predicted that a physicist and a mathematician would be the most likely pairing to produce a boy, while a therapist and a chat show host would be odds-on favourites for a daughter. The study did not say why this phenomenon occurred, but The Sunday Times quoted a specialist in evolutionary psychology as saying it could be because the children of "systemiser" parents appeared to encounter more testosterone in the womb, making their gender more likely to be male. withdrawing from [The People's Romance] and creating an autonomous circle of authority, power, and experience. TPR helps to explain why Americans who lived through World War II generally remember it as a good time, even a time of improving material conditions, even though, as Robert Higgs (1992) shows, it was a time of significantly declining material conditions. Love may be blind, but Klein concludes that technology, in the form of the internet, cable television, talk radio is making more and more people aware that the affair is only skin deep. ...why do Paul Krugman, Bradford DeLong, ...and others in their ideological quarters, including a great many who are not as prominent but just as settled in their opinions, almost never emphatically favor libertarian reform on any of the one thousand issues where such reform would plainly benefit society, especially the least well off? The DARPA Grand Challenge, organised by the US government's Defense Advanced Research Projects Agency, pits driverless vehicles against one another in a daring dash across a 280-kilometre stretch of hazardous Californian desert. The winner must complete the course in less than 10 hours in order to scoop the $2 million prize. The vehicles must run the whole race without a human driver, autonomously identifying and steering around corners or unexpected dangers, such as boulders or ditches. No vehicle completed the course in 2004 event, which saw a number of competitors crash spectacularly and some struggle to make it from the starting line after malfunctioning. The most successful vehicle was a modified Humvee built at Carnegie Mellon University in Pittsburgh, US, which completed 12 km before being deactivated close to a cliff edge. But among the frontrunners in 2005’s race is likely to be the new SUV, nicknamed Stanley, developed at Stanford University's computer science lab and Volkswagen's Electronics Research Laboratory, both in California, US. ....Stanley builds a 3D picture of its surroundings in real time, using an array of stereo video cameras and roof-mounted laser range-finders. A suite of seven laptop computers in the trunk analyse this information 10 times a second, adding GPS satellite data to its picture of the world. Currently, the vehicle can career along at a comfortable 55 km per hour with no human intervention whatsoever. ...."Stanley has been equipped with drive-by-wire, which allows us to electronically steer, brake, accelerate and shift the vehicle," says Cedric Dupont, one of the team. "The computer can take control of the things that a driver typically does." .... Here's what I think will happen if and when China changes its currency policy, and those cheap loans are no longer available. U.S. interest rates will rise; the housing bubble will probably burst; construction employment and consumer spending will both fall; falling home prices may lead to a wave of bankruptcies. And we'll suddenly wonder why anyone thought financing the budget deficit was easy. I'm not saying we should try to maintain the status quo. Addictions must be broken, and the sooner the better. After all, one of these days China will stop buying dollars of its own accord. And the housing bubble will eventually burst whatever we do. Besides, in the long run, ending our dependence on foreign dollar purchases will give us a healthier economy. In particular, a rise in the yuan and other Asian currencies will eventually make U.S. manufacturing, which has lost three million jobs since 2000, more competitive. Meaning, that since the Bush Treasury has decided to pressure China to stop propping up their currency, they're trying to break up the 'status quo'. So, why is Paul whining? 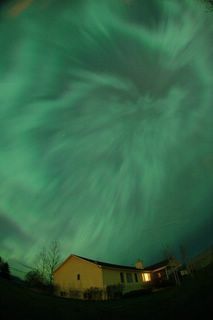 Let's guess; near Area 51? ALBUQUERQUE, N.M. (AP) -- One of Orlando Romero's calves has a leg up on the other 25 calves born within the last two weeks on his ranch east of Tucumcari. The calf was born with an extra leg, with two hooves, growing from its back. ....The week-old calf's extra leg does not touch the ground. It is attached to the calf's back between the shoulder blades, and hangs to its right side. The branch-like growth is the only major difference between the copper-colored calf and the rest of the herd, said Shane Jennings, a neighbor who first spotted the heifer. ....Milton Thomas, professor of beef cattle physiology and genetics at New Mexico State University in Las Cruces....said extra body parts are a freak occurrence. ....Thomas said extra appendages result of a cellular mix up during the replication of genetic material in early embryo development. Certain cells will develop into tissues such as muscles or organs, but some receive skewed signals and grow into unnecessary parts. Desalinated seawater from deep below the ocean's surface has become a hit product in Japan, where it is marketed as a pure and nutrient-rich alternative to tap and spring water. ...."It's pretty exciting," said Roger Morey, senior vice president of Pearl City-based Hawaiian Natural, which sells Hawaiian Springs drinking water. "You can get deep seawater anyplace, but you can only get Hawai'i deep seawater right here in Hawai'i." .... Driving the boom is a Japanese thirst for deep seawater that started several years ago. Nearly all the water bottled locally is sent to Japan, where it sells for $3 to $4 a bottle. Coming from deep below the ocean's surface, the water is touted as being thousands of years old and free of modern impurities. The desalinated Hawaiian deep seawater also is marketed as a dietary supplement that helps with weight loss, stress reduction, improved skin tone and digestion, and other benefits that have yet to be proven via scientific study. If you have [not] sampled the inimitable Let's Fly Under the Bridge, you should. If for nothing else, for one of the best tag lines ever: "Dedicated to countering excess self-esteem by providing feedback not found in polite company." We'd include more but, the excess self-esteem meter's needle is close to the danger zone. "I was wrong. And, I'm sorry." Lawrence H. Summers, the embattled president of Harvard University, announced yesterday that the university would spend at least $50 million over the next decade to recruit, support and promote women and members of underrepresented minority groups on its faculty. Dr. Summers said the money would be spent on a range of initiatives, including the creation of a new senior vice provost post to focus on diversity issues, improved recruitment, subsidies for salaries, mentoring of junior faculty members and extending the clock on tenure for professors who go on maternity or parental leave. So one of the ways of looking at economies is the extent to which they make use of the existing knowledge in the society, which, as Hayek and others have pointed out, is scattered in tiny fragments among millions and millions of people. And when you have pricing systems, then those people coordinate their activities. Nobody can keep track of 24 million prices. If you have 100 million people and each one keeps track of a handful of prices that are relevant to what he is doing, then it's manageable. One of the other things that became clear to me when I did research for Basic Economics, is that knowing knowledge with insight, knowing what the knowledge means, how to apply it, that varies enormously. And in a market economy whoever has that insight—if he's right—it really doesn't matter that the other side may be better organized or even financially better off. I think a classic example was the creation of chains of department stores in the 1920s, that Sears and Montgomery Ward had been going on for decades as purely mail-order houses, and they were the biggest retailers in the world and very successful. But as the society becomes more urbanized, the point is reached where more people are living in the cities than in the country, and therefore it's cheaper to deliver to those people through department stores than through mail-order houses. Now neither Sears nor Montgomery Ward wanted to believe this. Along comes some guy from a little town in Wyoming, named J.C. Penney, and he believes it. It doesn't matter that he's a nobody and these people are the leaders of the world. He starts putting this into practice. And by 1920 he has 300 stores, and Sears and Montgomery Ward suddenly find themselves with millions of dollars of red ink. And as the years go by, they are finally forced against their will to start opening department stores, otherwise they're about to go under. And think of someone like Henry Ford, as I mention in the book, who was so poor that he had to walk eight miles to Detroit to look for a job. But when he had the idea of mass production and got it under way, it didn't matter that he was nobody. What mattered was he could produce cars cheaper than anybody. But when you have a system that is socialist or run by any kind of centralized group, maybe a political party or royalty, whatever, then the only insights that really matter are the insights of that small in-group at the top. And they are necessarily very limited, as any similarly sized group of people would be. But in the market, whoever has the bright idea—it takes off. The New York Times Co. (NYT) on Monday said that, starting in September, access to Op-Ed and certain of its top news columnists on the paper's NYTimes.com Web site will only be available through a fee of $49.95 a year. The service, known as TimesSelect, will also allow access to The Times's online archives, early access to select articles on the site, and other features. The report that a Koran had been flushed down a toilet set off the most virulent, widespread anti-American protests in Afghanistan since the fall of the Taliban government more than three years ago. "We regret that we got any part of our story wrong, and extend our sympathies to victims of the violence and to the U.S. soldiers caught in its midst," Mark Whitaker, Newsweek's editor, wrote in the issue of the magazine that goes on sale at newsstands today. In an accompanying article, the magazine wrote that its reporters had relied on an American government official, whom it has not identified, who had incomplete knowledge of the situation. But Mr. Whitaker said in an interview later: "We're not retracting anything. We don't know what the ultimate facts are." Being Newsweek means never having to say you're sorry? Public displays of affection are against the rules at Sky View Middle School in Bend, and 14-year-old Cazz Altomare found that out the hard way. ....administrators said such policies are standard-issue at middle schools across the country. "Really, all we're trying to do is create an environment that's focused on learning, and learning proper manners is part of that," said Dave Haack, the principal of Cascade Middle School, also in Bend. "This is not us being the romance police." ....Outside Pilot Butte Middle School on a recent lunch break, two seventh-grade girls said they disagreed with the school's policies. "I think we should be able to hold hands or hug at least," Annie Wilson, 12, told The Bulletin in Bend. "Because it's not doing anything bad." ....At home after school on a recent afternoon, Cazz, the Sky View student, described the no-hug rule as "dumb." KATMANDU, Nepal — Soldiers rescued about 600 students who were abducted from their classrooms in western Nepal in a series of bold strikes by communist rebels, army officials said Sunday. The rebels - who claim to be inspired by Chinese revolutionary Mao Zedong - have fought since 1996 to overthrow Nepal's constitutional monarchy and replace it with a communist state. No child left behind, Little Red Book style. "I welcome this debate," the minority leader, Senator Harry Reid of Nevada, said in a statement. "The time has come for Republican senators to decide whether they will abide by the rules of the Senate, or break those rules for the first time in 217 years of American history." 2005 minus 217 = 1788, so Reid is obviously claiming that the filibuster was part of the rules of the first Senate. Which, as we have previously seen in this paper by Gold and Gupta, is not true. The first Senate adopted the rule of the British Parliament that a majority could vote to cut off debate on a bill for the purpose of voting on it. It appears that than an act of Aaron Burr, presiding over the Senate in 1806, inadvertently created the possibility of the filibuster by eliminating that, "previous question", rule. And it wasn't until the 1830s that a group of anti-Jacksonian Senators realized that that had the effect of allowing unlimited debate if even only one Senator wished to keep talking. Robert C. Byrd (D-WV) raised the possibility that the U.S.
by the dead hand of the past. majority vote. Those rules have been changed from time to time . .
and would vote repeal of it by majority vote." This motion was a well entrenched tradition among legislatures of the time: It had been recognized by the British parliament since 1604, by the Continental Congress, and by the House of Representatives,...which still observes it to this day. "The fact is that so-called unlimited debate in the Senate is a myth. most part effectively did, limit debate and prevent filibusters… . And, in 1917, the practice became intolerable to Woodrow Wilson--in the face of threats by Germany to open unrestricted submarine warfare on American commercial shipping, alongside an offer to Mexico to join with them, in exchange for an opportunity to recover lands formerly belonging to that country, but now States--eleven isolationist senators (led by Robert LaFollette) prevented a vote on a Bill to allow merchant shipping to be armed for protection. The Senate of the United States is the only legislative body in the world which cannot act when its majority is ready for action. A little group of willful men, representing no opinion but their own, have rendered the great government of the United States helpless and contemptible. And that led to a change in Senate rules (known as 'cloture') that allowed a two-thirds majority of the Senate to cut-off debate. Over many years of filibusters of Civil Rights legislation attempts were made to loosen that requirement, and finally, in 1975 it was reduced to a 3/5 majority. In June 1968, Chief Justice Earl Warren informed President Lyndon Johnson that he planned to retire from the Supreme Court. Concern that Richard Nixon might win the presidency later that year and get to choose his successor dictated Warren's timing. A seasoned Senate vote-counter, Johnson concluded that despite filibuster warnings he just barely had the support to confirm Fortas. ....Johnson urged Senate leaders to waste no time in convening Fortas' confirmation hearings. Responding to staff assurances of Dirksen's continued support, Johnson told an aide, "Just take my word for it. I know [Dirksen]. I know the Senate. If they get this thing drug out very long, we're going to get beat. Dirksen will leave us." ....Those hearings reinforced what some senators already knew about the nominee. As a sitting justice, he regularly attended White House staff meetings; he briefed the president on secret Court deliberations; and, on behalf of the president, he pressured senators who opposed the war in Vietnam. When the Judiciary Committee revealed that Fortas received a privately funded stipend, equivalent to 40 percent of his Court salary, to teach an American University summer course, Dirksen and others withdrew their support. Although the committee recommended confirmation, floor consideration sparked the first filibuster in Senate history on a Supreme Court nomination. On October 1, 1968, the Senate failed to invoke cloture. Johnson then withdrew the nomination, privately observing that if he had another term, "the Fortas appointment would have been different." Sound Transit says a March report overestimated the cost of a possible bus-only, high-capacity transit system for the Eastside by about $1 billion because the authors misunderstood some key information from the state Department of Transportation. The mistake accounted for half of a whopping $2 billion drop in the cost estimate for an Eastside "bus rapid transit" (BRT) system that Sound Transit released yesterday. Critics have charged that the March report, on future transit options, was biased to favor light rail over BRT, a bus network that mimics many features of rail. ....Sound Transit is beginning to piece together another package of projects to submit to urban King, Snohomish and Pierce county voters, perhaps in November 2006. Rail-versus-BRT on the Eastside is shaping up to be a major battle. ....It estimated the capital cost of an Eastside BRT system, using freeway high-occupancy-vehicle (HOV) lanes, at $4.4 billion to $5.8 billion in today's dollars, compared with $4.6 billion to $6.2 billion for a light-rail system. ....Yesterday, Sound Transit released a much-lower estimate for BRT: $2.5 billion to $3.5 billion. In the case of United Airlines, the company has been able to secure bankruptcy financing by agreeing to suspend payments to its already severely underfunded pension plans. The defined benefit plans are one of many factors weighing down the airline's cost structure because United must compete against carriers offering less expensive plans. Prior to the 1980s, most employer-sponsored pension plans were traditional defined benefit plans. With a defined benefit pension plan, a firm guarantees a monthly or lump sum payment to workers after retirement. The dollar amount of this payment depends on a predetermined formula, typically based on a worker's salary during the last few years of employment and the number of years on the job. Companies completely fund defined benefit plans, and all aspects of the plan are solely under the firm's control. Unless the firm goes bankrupt, monthly payments to retirees are not tied to the quantity of funds set aside by the firm. Therefore, the company bears the entire risk of making pension payments. ....Since the mid-1980s, companies have increasingly switched to defined contribution plans that give employees even more control and responsibility for their pensions. With defined contribution plans, the most common form of which are 401(k) plans, employees accumulate money for retirement by making pretax contributions from their salary. ....With a traditional defined benefit plan, the company bears all the risk of having sufficient assets to meet pension obligations. When the stock market falls and asset values plunge, it is the firm's responsibility to add funds to fulfill pension payments. Usually this requires diverting income from current revenue into pension plans, an action that may have implications for the viability of a company that is already in dire financial straits. ....Defined benefit plans can boost profits during periods of prosperity and add to losses during economic downturns, amplifying cyclical swings in the company's balance sheet. This can exacerbate financial problems and impede a firm's ability to stay competitive. .... many companies with defined benefit plans have weathered the recent economic downturn without significant disruption to their business. It is primarily in industries already in significant decline—such as steel, or those suffering from extraordinary events, such as airlines after September 11—that the recent economic events have precipitated additional burdens on the long-term viability of numerous firms and their pension plans. ....Although the government does not directly insure private pensions, ERISA created the self-funded PBGC to take over the payment of benefits in the event a plan ends without sufficient money to pay beneficiaries. The PBGC is financed from premiums paid by the companies it protects, from the assets of pension plans it has taken over, and from investments of any surpluses or assets. ....the PBGC is likely to assume additional pension plans and its deficit will worsen in the short run. However, outside the steel and airline industries, a massive failure of defined benefit plans that would precipitate an S&L-style bailout of the PBGC is unlikely. The current economic recovery—in addition to temporary legislative relief and a transition to defined contribution plans in which employees bear more of the risks surrounding pension incomes—will help all except the most troubled companies get back on solid footing. Social Security more closely resembles a defined benefit plan, but without the guarantee of the PBGC. George W. Bush's private accounts would be defined contribution plans. Petty theft and about 100 other nonviolent misdemeanors - including forgery, credit card fraud and car break-ins - won't be prosecuted by the Lane County district attorney starting today. With about 150 new criminal cases filed each week, something has to give in order for the county's 21 criminal prosecutors to handle higher-priority violent crimes, Lane County District Attorney Doug Harcleroad said Tuesday. Prosecutors will focus on violent crimes, domestic violence, felony property crimes involving burglary and losses of $750 or more and drug dealing, he said. ....Harcleroad, who returned to office in January, acknowledged that his latest policy change may rub residents the wrong way, but he said it comes down to setting priorities with limited resources. ....Harcleroad also would not speculate about the cause of continuously rising caseloads, other than noting that 400 law enforcement officers feed their work into his office. However, Chief Deputy District Attorney Kent Mortimore said some of the increase is driven by criminals who are released from jail because of overcrowding and who continue to commit new crimes after release. ....The reduction is part of the overall erosion in local public safety programs that ranges from inadequate reform programs for juveniles up to a 340-bed county jail that has 119 beds vacant because of budget constraints, Harcleroad said. He said he and other officials are working to persuade community leaders and the public to form a public safety service district to raise revenue for specific enforcement services. "It's about the only viable solution," he said. "The whole justice system in Lane County is badly deteriorated." Nevada's legal brothels are practically begging the state of Nevada to tax them, hoping that will endear them to the public and give them more political security and, ultimately, more business. Last month, one proposal to impose the tax failed to come to a vote in a state Assembly committee; another was gutted in a Senate committee. A spokesman for Republican Gov. Kenny Guinn said the idea was "not something the governor is going to waste any time on." Bringing to mind the old joke, "What did the sadist say to the masochist?" Bobbi Davis, owner of the Shady Lady Ranch, a brothel about 120 miles (193 kilometers) outside Las Vegas, said paying taxes is the way to go. Precious, a prostitute at the Shady Lady Ranch, said that even if the owners pass the tax on to the girls, it won't be a problem. "What's a couple extra dollars off? I can waste that on lip gloss or new eyeliner," she said. "That's chump change for what some of the girls make here." But will it amount to 12% of GDP? Gideon Barlow, a castoff from a polygamous community on the Utah-Arizona border is trying to reshape his own. And he's grappling with the trials of a conventional life, worrying about not betraying his old parents while trying to please his new ones - Stacha and Neil Glauser, who took him in last August. ....Barlow - the son of polygamist Dan Barlow, banished from the Fundamentalist Church of Jesus Christ of Latter Day Saints in January 2004 - is one of dozens of a group known as the Lost Boys, who have fled or been kicked out of the polygamous communities of Hildale, Utah, and Colorado City, Ariz.
...Their plight became more public in the past year as former followers of FLDS leader Warren Jeffs began to speak out about his harsh rule. Barlow's story shot to prominence last week during a town meeting on polygamy in St. George, when the Glausers publicly questioned how his 73-year-old father could draw money intended to help minor children. Arizona county and state agencies this week began investigating the allegations. ....a woman who helps teens displaced from the twin cities put him in touch with the Glausers, who agreed to take him in. Stacha Glauser recalled her astonishment when Barlow's parents willingly relinquished their son. "It was just not that big a deal," she said. ....But the elder Barlow continued to use his son to claim government benefits, drawing Social Security funds in his name. The Glausers found that out in November, when they had Barlow apply for a Medicaid card so he could get health and dental care. Social Security allows retirement age people, such as Dan Barlow, to collect a stipend to help support children ages 16 or younger who still live at home. They're supposed to file reports explaining how the money is used. In addition to Barlow, Dan Barlow has at least eight minor children living with their mothers in Colorado City. It's not known whether he has collected Social Security funds on their behalf. Delia Lasanta, the Denver-based regional communications director for the Social Security Administration, said the elder Barlow's actions amounted to fraud. Armed with that, Barlow confronted his father. But Dan Barlow refused to hand over any money, saying he needed it to pay off credit cards. Finally he relented, and since November has given Barlow $200 a month. Lawmakers approved a bill giving the state power to take over any Arizona school district that "grossly mismanages" its money, and state officials said their first target would be the financially crippled Colorado City Unified District. In October, the attorney general found himself powerless to shut down Colorado City Unified after the district began bouncing teacher paychecks despite buying its own airplane.